Last Sunday was a day that I had been waiting for what seemed like an eternity. I had found out that James Blake was going to go on tour for his new album this past summer, and I immediately knew I had to attend. I would have loved to see him while he was touring for his Overgrown album, but seeing him perform his equally emotional and vocally-haunting The Colour in Anything was going to be a very close second. I didn’t get to buy my tickets right when they became available — I actually bought them the day before the Austin concert — but nonetheless, I was so extremely excited to see one of my favorite musicians live. James Blake was on my bucket list for artists to see live before I die, and it was finally going to happen. Fast forward to the night of the concert: my friend and I show up to ACL Moody Theater, super pumped, but at the same time, trying to keep our cool. I always forget how nice and relatively large this venue is, but it is always a pleasant surprise every time I go to this swanky downtown venue. Our seats weren’t near each other, but we managed to sneakily work our way together, “stealing” other people’s seats, ending up together in the balcony section. While we were sitting down, anxiously waiting for James to come on, hoping that no one shows up to claim the seats that were rightfully theirs, I looked around and studied the demographic of the people attending. Surprisingly, it is a crowd older than my age group. Then again, it’s not really that much of a surprise that this concert is catering to an older crowd. Not a lot of my friends from home like James Blake; they would always complain that he’s too boring and sounds like he’s crying all the time. I can see the appeal that this talented British musician has to the older crowd. It takes a certain level of emotional maturity in order to fully appreciate the sound that he creates. Suddenly, I’m quickly snapped back to reality as the lights begin to dim, signalling that the show is about to begin. 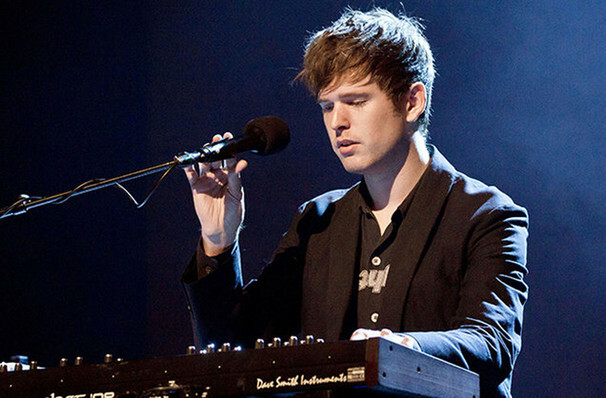 James Blake along with his two signature musicians, Rob McAndrews (guitars, samples) and Ben Assiter (drums), come out on stage, warmly welcomed by the crowd’s cheers and howls. They assume their position and start the show with “Always," the second-to-last track on Blake’s recent album. This makes me particularly happy; I love his use of distorted vocals in the track, along with the sample of Frank Ocean (another intense love of mine). The show continues, and one thing that particularly stands out is the lighting aspect of the show. Throughout the entire concert, the lights were synchronized with the beats of the songs, which added a whole new layer to the concert. Sometimes it became borderline seizure-inducing, but overall it was very tastefully done. James played songs from his entire discography, from the hits “Life Round Here” and “Retrograde” from Overgrown, to “200 Press”, a song that he wrote and composed relatively early in his musical career. A standout performance during the concert was definitely the song “Measurements” during his encore. Before he began the song, he told the audience, “Everything we do here is live. No computers or anything.” He then urged the audience to be completely and utterly silent — which unfortunately did not last for too long — and managed to create all of the loops in the song right there, before the audience’s very eyes. This not only showed off his perfected skills in terms of timing and use of the equipment but also his beautifully emotional vocal range. This song was a perfect way to end the night, and although it was not one of my favorites before seeing it live, it definitely is now. While watching the show, you’re definitely loving it and soaking in every single moment. However, nothing compares to the post-concert feels. Seeing James Blake in the flesh and hearing his strong yet soothing voice with my own ears is something I could never fully take for granted in the moment, and from the moment I exited the venue to me, right now, in bed, writing this post, I have not stopped thinking of how thankful I am that I got to attend this concert. His performance just proved that he is the embodiment of pure, raw talent, and it was truly one that I will never forget as long as I live.